What started out in January to be a small group of players coming from Colorado and Kansas City to play some 3-wall mushroomed into a one day event held March 28th held at Camelback High Schools great 8 court facility. 12 teams used the 21 small ball and 30 teams of Juniors used the Green Big Ball. All 8 courts were used from 9:30 am until almost 1 p.m. Jim Reitmyer had several Success for Kids teams and many Camelback HS juniors showed up to play. 4 Open Teams completed in a round robin. The teams were Glenn Carden, Bremerton, WA/ Jason Gregory, Denver; Dave Munoz, Phoenix/Brad Mrosla, Denver; Tom Disadore, Kansas City/Matt Schlict, Phoenix; Fred Lewis/Oscar Olivas, Tucson. Tom Disadore/Matt Schlict were the winners with Dave Munoz/Brad Mrosla coming in second. There were many long rallies and all the matches were excellent. The “2nd Flight Bracket” had 8 teams playing a 25 point game with rally scoring. Winning a game required a 2 point final margin. Several games went to 26 or 28 point in order to win. The eventual winners were Jorge Pimentel/Jose Maldonaldo, Tucson . They tied in wins with Arne Arneson, Denver/ Stan Townsend, Phoenix,- 6 wins 1 loss. However, each lost one game.The Tucson team won the bracket by scoring a total of 7 points more. Pimentel/Maldonaldo lost their only game 25-22 and Arneson/Townsend scored 15 points in their only loss. 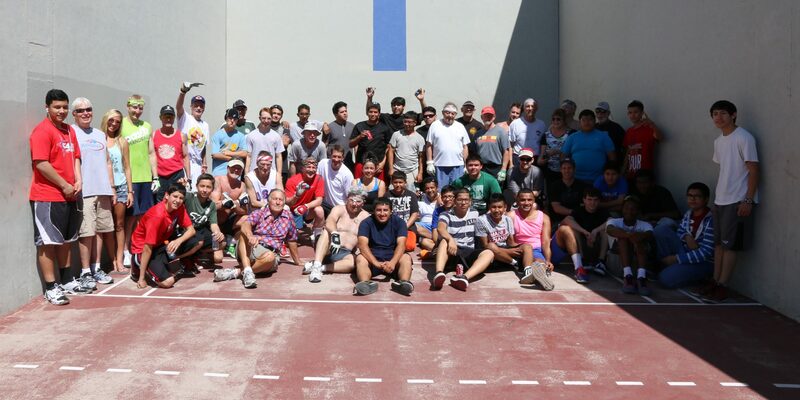 Following play, players went to Los Olivos Park about 3 blocks from the High School for some sub sandwiches and libations (copious amounts of beer) to rehydrate from the long day on the courts in 95 degree temperatures. What we learned. There are more than 100 outdoor courts in Phoenix. Based on the number of total courts that means there could be several thousand students use the courts on a daily basis. What a gold mine that we need to nurture!!! We are looking forward to next year for an even more successful event. Thanks to all the players that came to play “The Perfect Game” It was a blast! !